I was born in 1935 and spent all my early life at Zeehan on the West Coast of Tasmania. I was educated at St Virgil’s College Hobart and Curtain University. After leaving school I briefly worked in the family business. In 1954 I joined the Tasmanian Public Service and served with them for four years before leaving to join the Department of Native Affairs in New Guinea. I later worked as a public servant in West Australia and New South Wales, functioning mainly as an outreach social worker in remote areas. My first book To Hell or to Hobart was published in 1993 after I had completed four and a half years full-time research in Britain and Ireland. 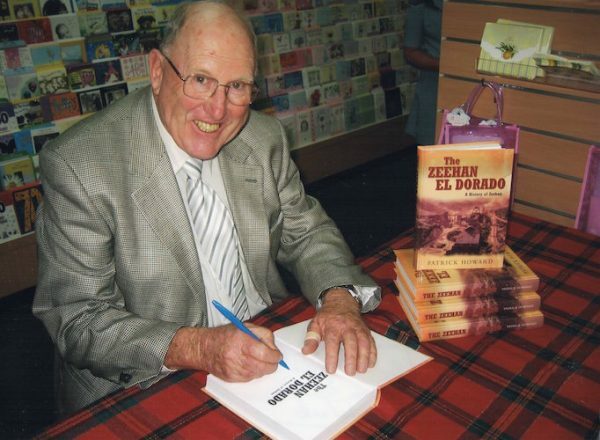 My second book The Zeehan El Dorado was published in 2006 after several years research. My third book Farewell Heemskirk Goodbye Dundas was published in 2010 and is a history of the Heemskirk and Dundas mining fields. At present I am working on a history of the traditional hotels of Tasmania’s West Coast and I hope to launch it at the Zeehan Gem Festival on 5 or 6 of November. The first book, a roots-style history of my convict ancestors, attracted excellent reviews both here in Tasmania, Australia and in Ireland. The other books had good local reviews. I was interviewed for my first book by journalist Annie Warburton and for the second by journalist Gil Vowles. Photograph taken at the launching of my second book in Burnie by an Advocate photographer.